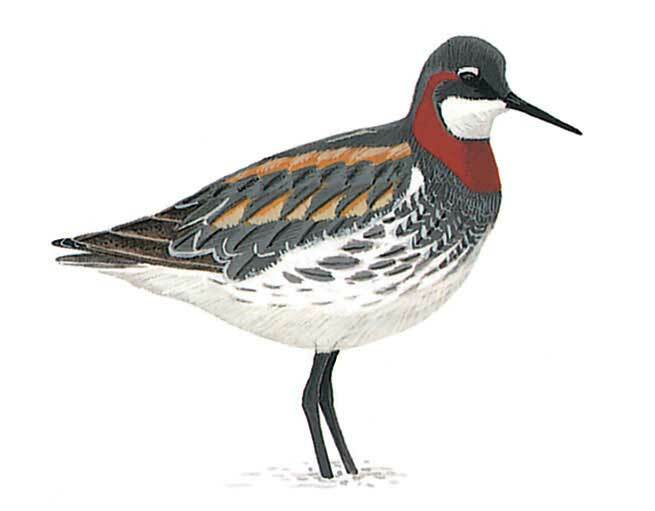 A small, elegant wader which swims high on water, often spinning to whirl up food items, which will be taken with needle-thin, black bill. Unmistakable in breeding plumage with striking head and neck pattern. In winter plumage upperparts are ash-grey with white lines and fringes, black mask through eye and black on hind-crown conspicuous. Juvenile has similar head pattern, but upperparts are blackish brown with prominent ochre bands. Flight is fast and jerking, and wings show distinct white wing-bar. Often settles on water.